Above: Gabe Reed is honored by SAEM Associate Professor Ed Traversari at his CD and video release party. 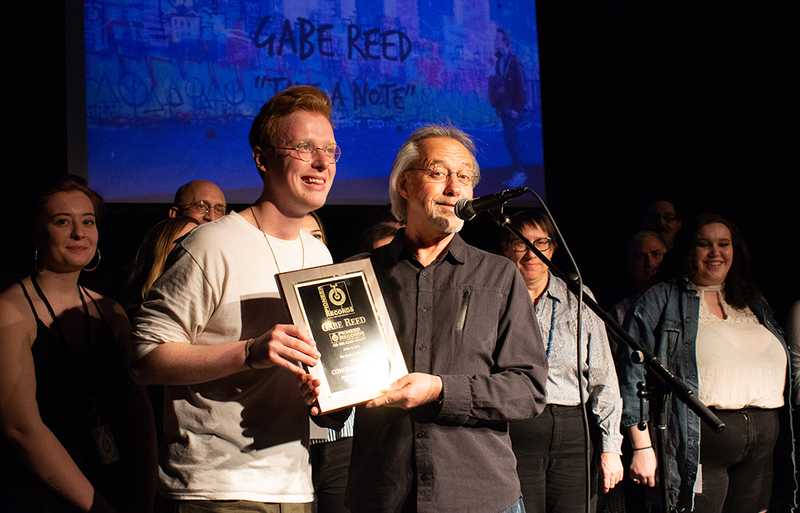 Pioneer Records artist and senior musical theatre major Gabe Reed’s Take a Note music video debuted April 12 with a music video and CD release party at The Club at Stage AE. The party featured performances by Reed, Luke Wood, WYEP’s latest Reimagination recording artist, and Saige Smith, Point Park senior musical theatre major. Reed’s video was created by Point Park University cinema production and sports, arts and entertainment management students taking the Music Video Workshop class, co-taught by Cinema Arts Associate Professor Andrew Halasz, M.F.A., and SAEM Part-Time Instructor Greg Joseph. "The cinema production and SAEM students worked hard to create an impressive product and their energy and excitement really shows through in the video," Joseph said. 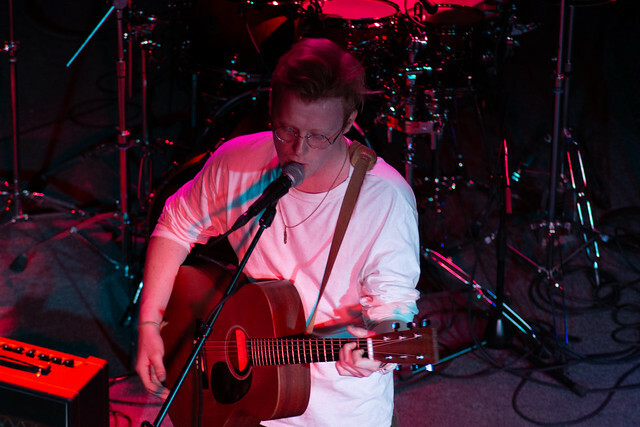 Joseph added: "The music video debut for Gabe Reed’s Take a Note was a special moment at the show. The reaction from the audience was incredibly positive." "I was lucky to be chosen as the editor for Gabe's music video. It was stressful, but also a blast. Editing was a process of trial and error. I took feedback from my classmates each week and applied it to the cut until we all felt it represented Gave perfectly and flowed smoothly," explained Alexis Johnston, a junior cinema production major from Oak Glen High School in Buffalo, N.Y.
Johnston added: "The cinema professors don't just teach us the technical sides of each profession — they push us in the right direction when we're lost. They encourage us to do more, to try harder." Under the direction of SAEM Associate Professor Ed Traversari, several Pioneer Records apprentices and interns were responsible for planning and promotion of the release party. According to Traversari, the release party was a culmination of Reed’s recording project at Red Caiman Studios with Jesse Naus, engineer, producer and part-time SAEM instructor. “Going from observing the brainstorming process for the music video and attending recording sessions at Red Caiman to watching the video premier was an incredible experience,” said Megan Clista, a freshman SAEM major and from Cumberland Valley High School in Mechanicsburg, Pa.
Social media promotion before and during the event was among Clista’s duties as marketing and public relations intern for Pioneer Records. As the multimedia apprentice for Pioneer Records, Mariah Gigler, a junior SAEM major from Chartiers Valley High School in Pittsburgh, designed Reed’s EP album art. “Thanks to the SAEM program, I’ve had so many great opportunities at Point Park, one of the most rewarding ones being the chance to work for Pioneer Records,” Gigler said. SAEM sophomore Gia Zazzera from Plum Senior High School in Pittsburgh was responsible for designing fliers for the release party, assisting with production of the show and selling Reed’s EP, Chasing Grey. Reed’s three-song EP, Chasing Grey, is available to purchase on campus in the Pioneer Records office, located on the 11th floor of West Penn Hall.